Good friends with Eddie Vedder and John Frusciante. Oddly, for all the band's early punk cachet, Johnny was a lifelong Republican who was a Rush Limbaugh fan and an avid viewer of Fox News and Bill O'Reilly. 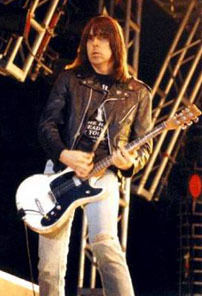 In the 1980's, Johnny married Joey Ramone's ex-girlfriend, Linda. For the last five years of his life, Johnny suffered from prostate cancer, undergoing frequent chemotherapy before dying at his home in Los Angeles.